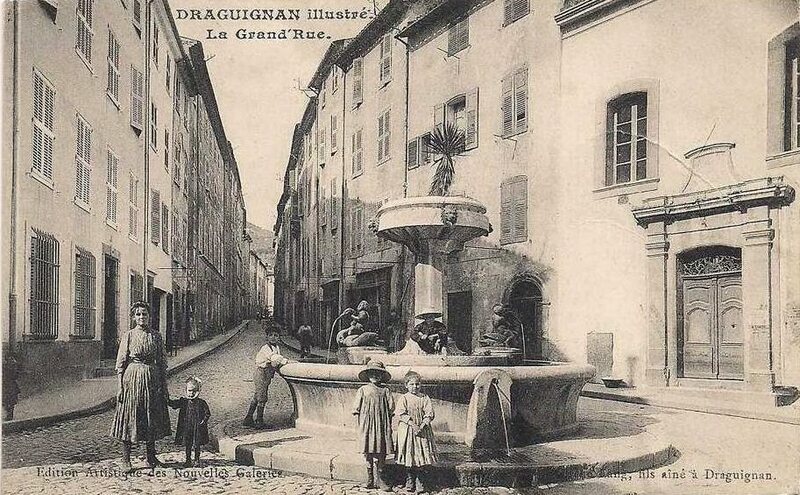 Draguignan became the defacto headquarters of the Chemin de Fer du Sud. 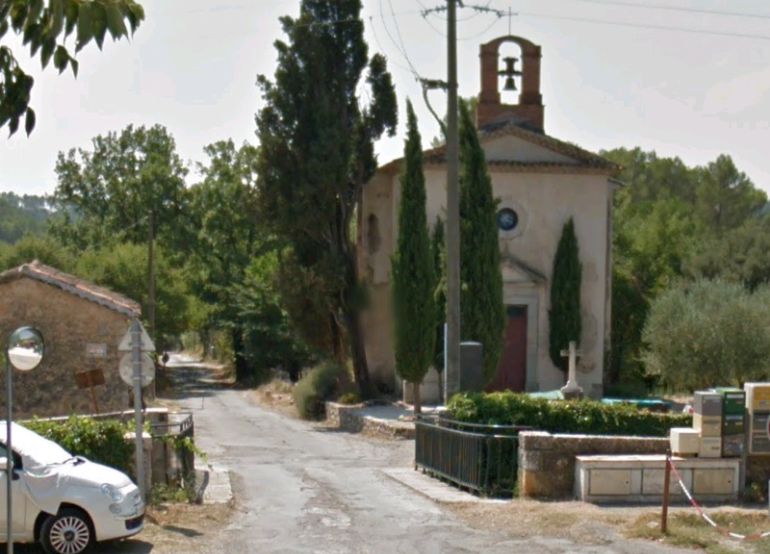 It was the most significant town on the route from Nice to Meyrargues. The site of the station lay directly alongside the PLM Station. 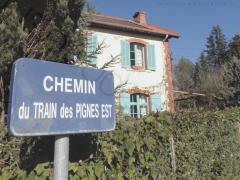 The PLM Station was the terminus of a brachline which left the PLM mainline between Toulon and Nice at Les Arcs. 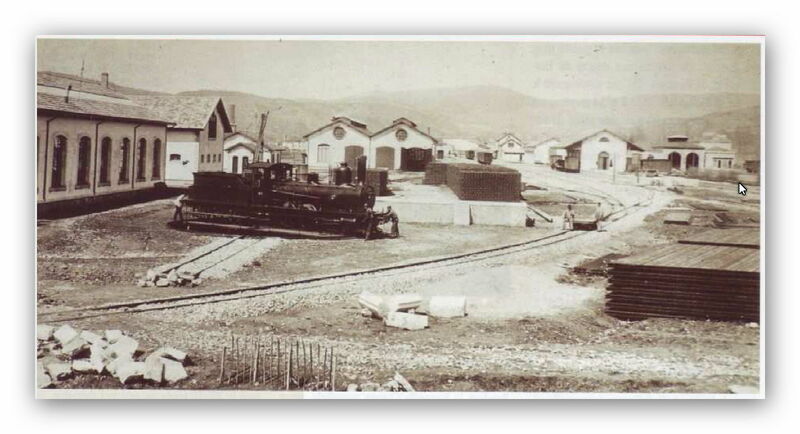 Construction of the line commenced in 1859 and it was formally opened in 1864. 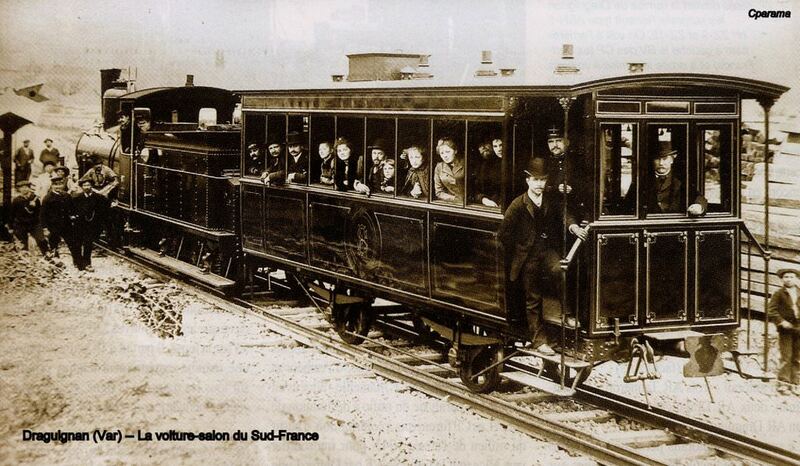 It was operated by the PLM until the SNCF was formed. 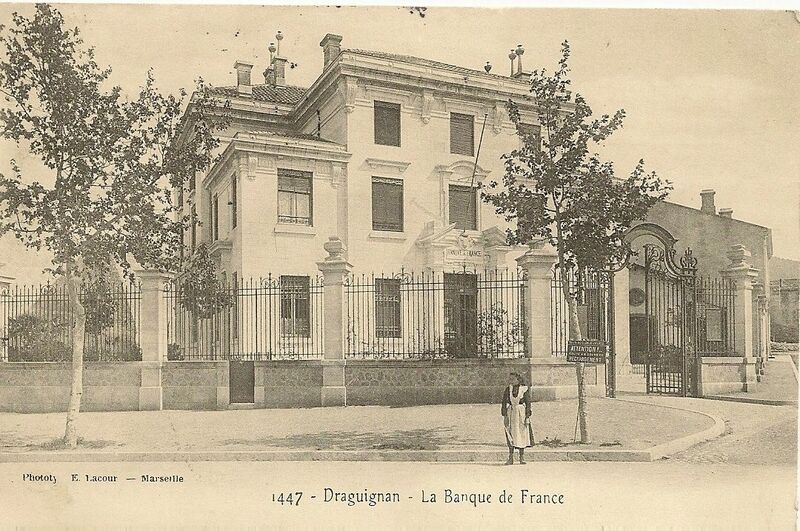 In 1981, the PLM station in Draguignan was closed to rail traffic and became a mere point of sale for tickets. A bus station was built where the tracks had once been laid. 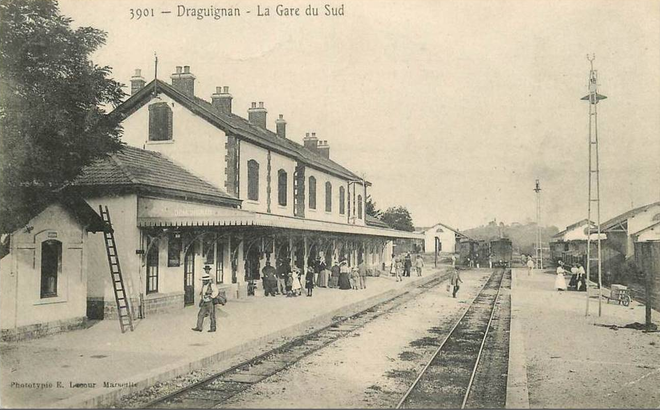 Passengers still use the old station platform but now they are waiting for buses. 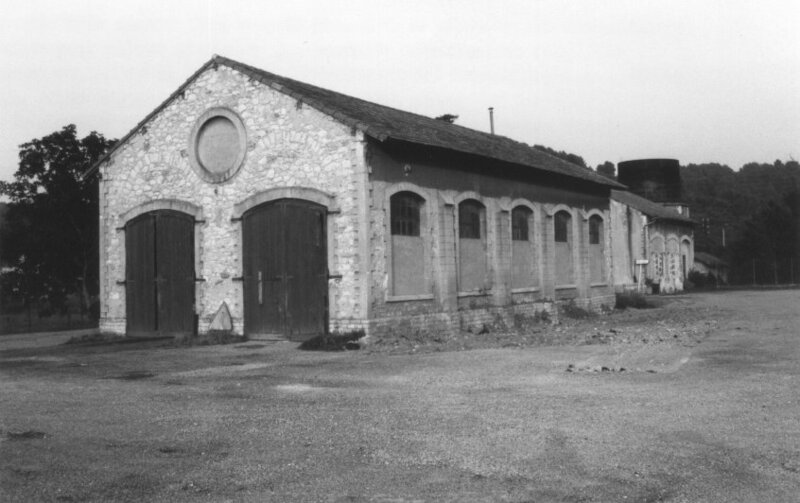 In addition to the passenger building some vestiges of the railway can be found, some buildings and the turntable pit. 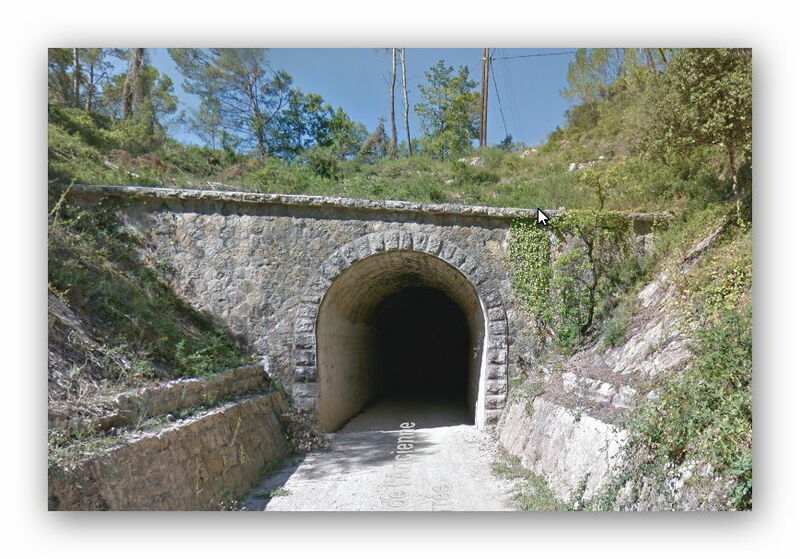 The old track-bed of the line to Les Arcs has been given over either to roads or bike paths. 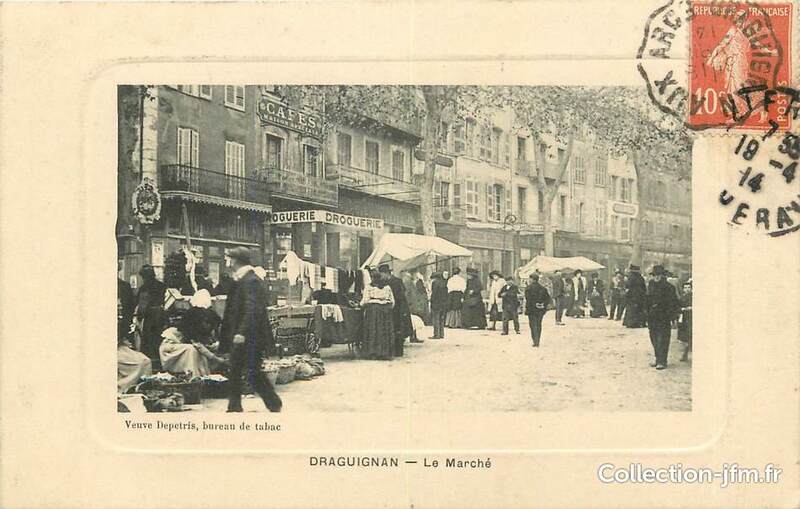 The image above shows the engine shed in Draguignan after the War. 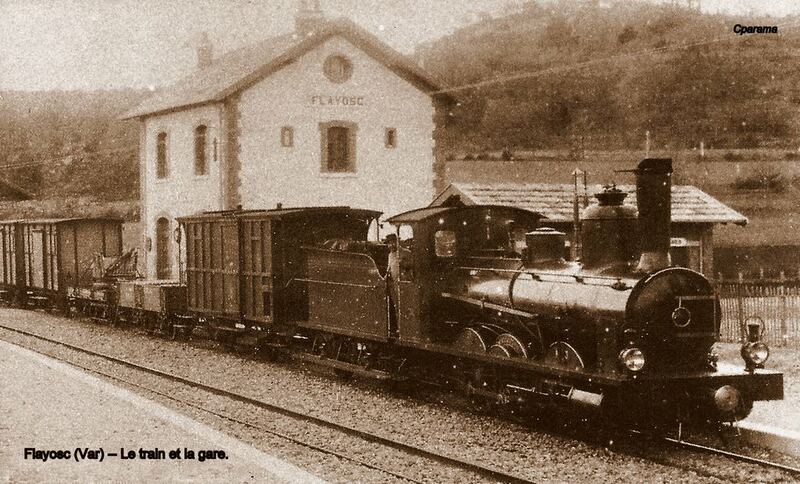 The image was taken by Pierre Virot and appears on p83 of Jose Banaudo’s book ” Le Train des Pignes. 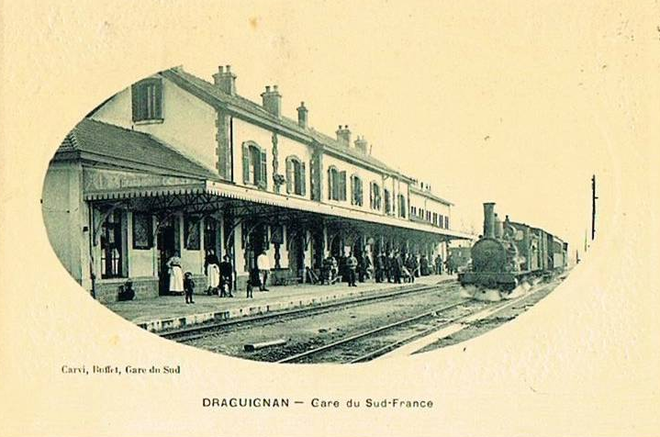 Draguignan became an increasingly significant railway hub with the creation of the Central Var Line. 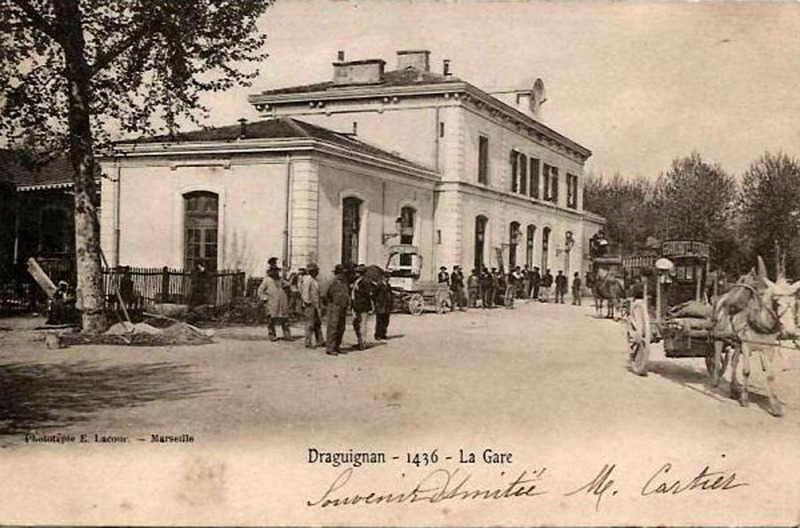 The formal opening of the station for the metre-gauge line took place on 25th April 1890. 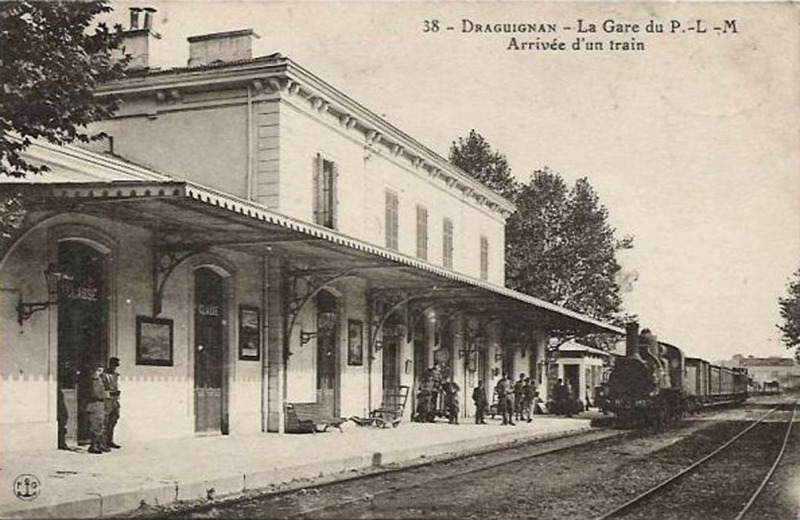 The metre-gauge line with its slow speeds could not withstand competition from the road and the last train entered Draguignan station on January 2, 1950. 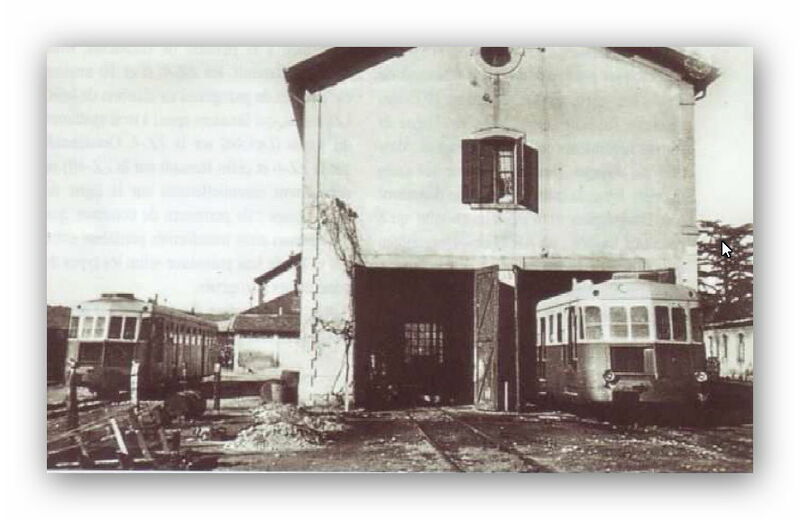 The main station building is now converted into a school and the goods facilities have been demolished. 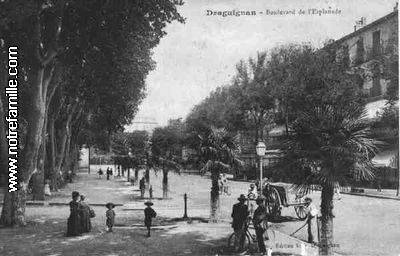 The railway track-bed is now predominantly occupied by public roads. 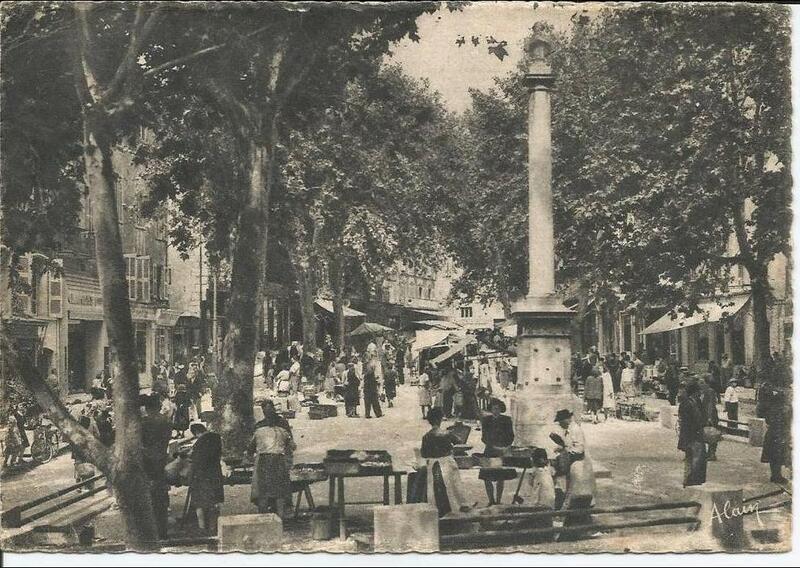 The square at the east end of the old train station was named Place des Train des Pignes , to commemorate this once important means of transport for the people of Draguignan. In addition to the two station buildings there are still some platform edges and some other minor vestiges of the relatively large combined station complex. The majority of the site has been redeveloped by the town. 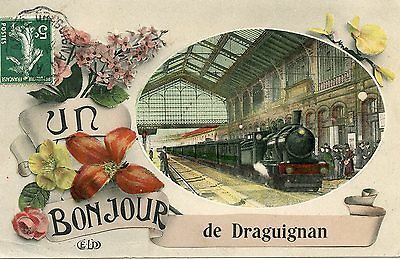 And finally, before we set off from Draguignan a postcard image that purports to be a welcome to Draguignan but clearly, from what we know about the station buildings, bears an image that does not come from the town. 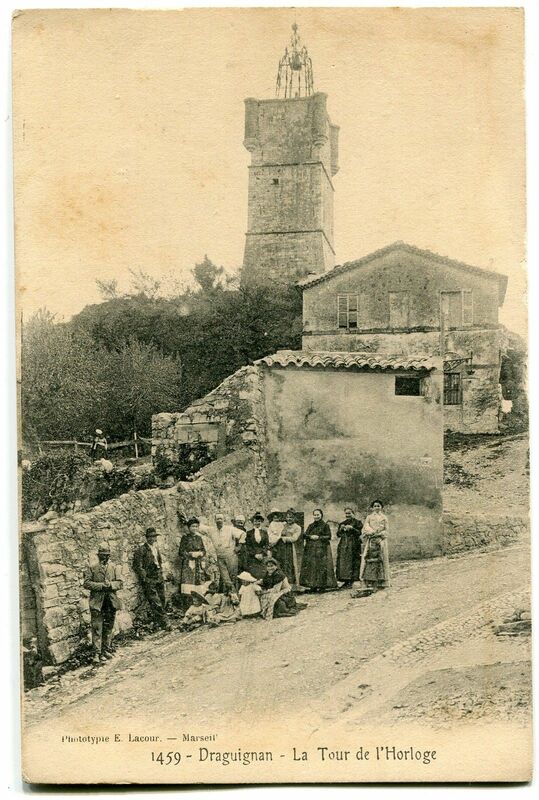 It looks more as though it is an image from one of the stations on the mainlin e nearer the coast, possibly from Les Arcs. 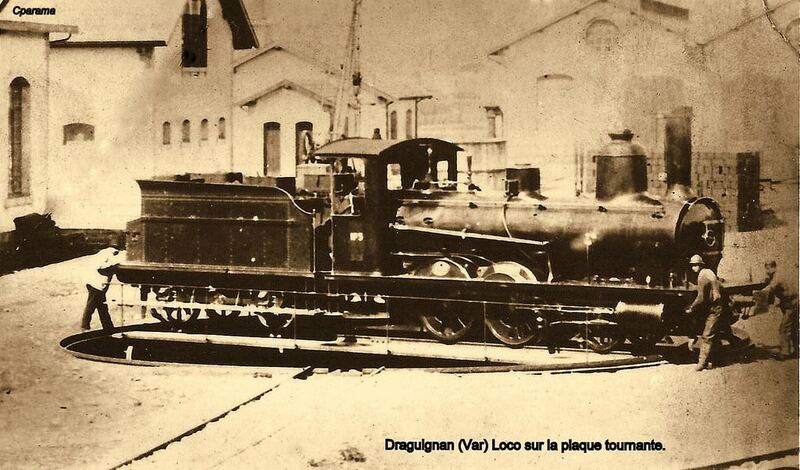 Perhaps as we set off from Draguignan along the Chemin de Fer du Sud we could imagine travelling behind the loco shown on the the picture below, rather than on the standard gauge train shown above! 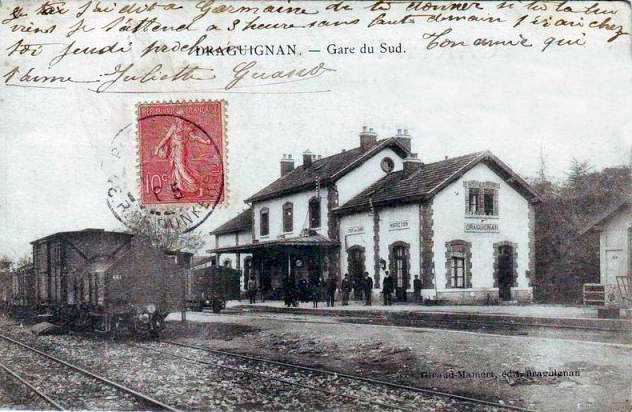 The line towards Meyrargues sets off from the old station on Boulevard des Fleurs in an approximately Westerly direction following the line of what is now the D955 out of town towards La Garrigue. 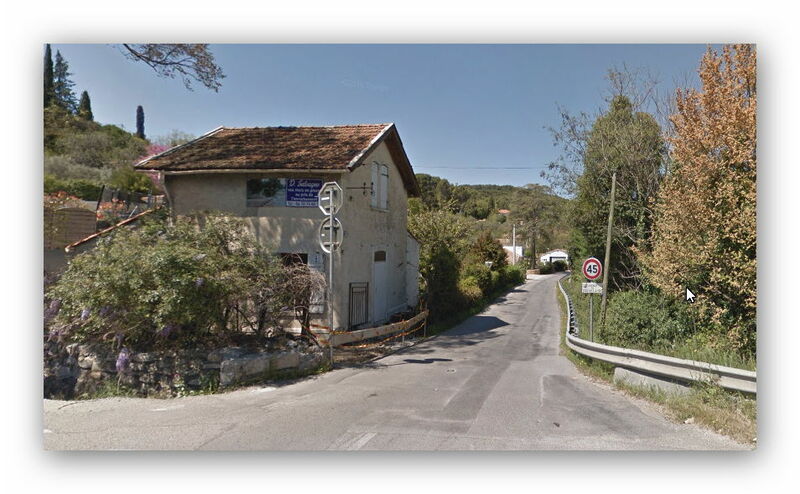 Just as the D955 reaches La Garrigue, the route bears off to the left towards Pont d’Aups, just above the road number marker in the top left of the map below. 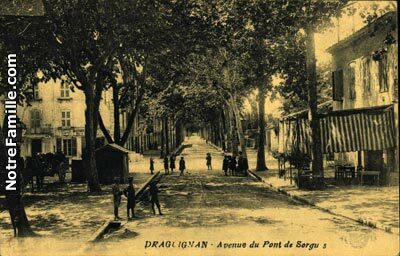 In Pont d’Aups the rail line ran alongside the road and spanned the river on a single span arch bridge before crossing over a low-headroom bridge across Avenue du Col-de l’Ange, the road south towards the village of the same name, Col-de l’Ange. 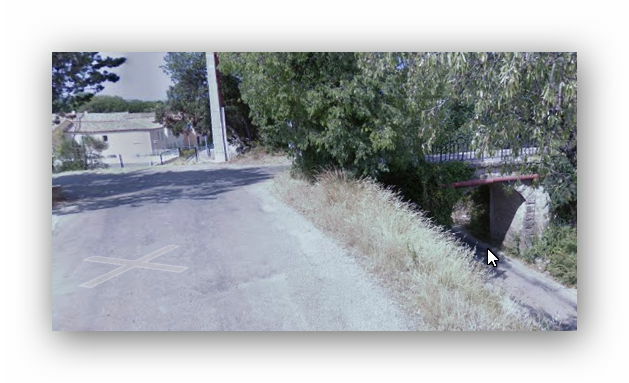 On our recent visit the girders from the bridge shown on Google Streetview had been removed to allow vehicles of all heights to travel south to north and vice-versa. Research suggest that this probably happened around 6 or 7 years before our visit in 2017. 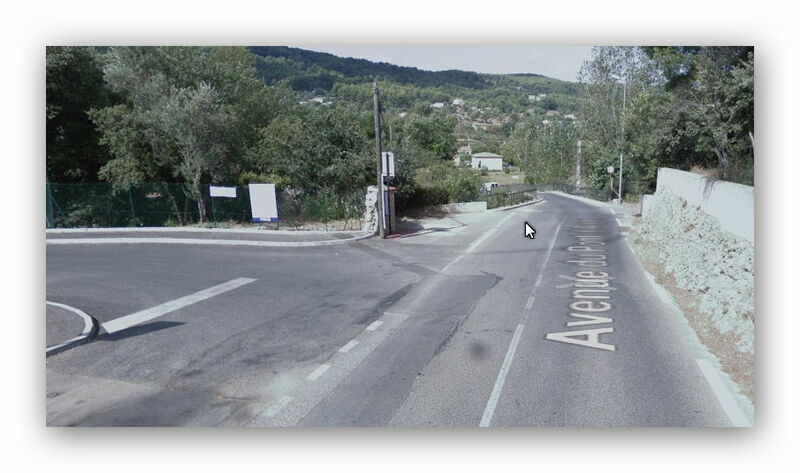 After Pont d’Aups, the route of the line followed Chemin du Seyran (on its South side) for a short distance before swinging done Southwards to join Avenue du Col-de l’Ange. 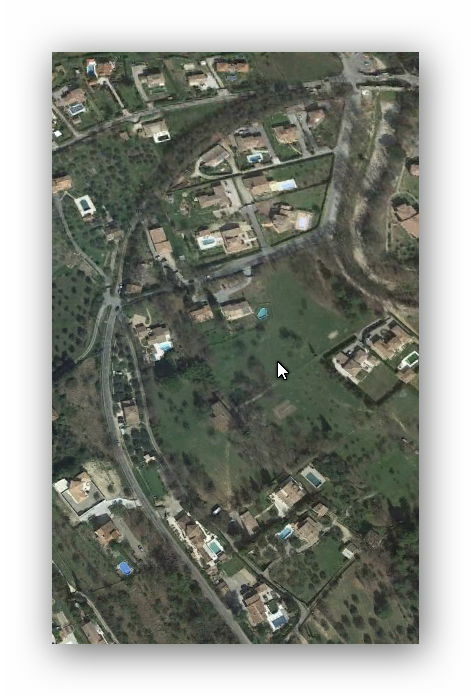 The route can be easily picked out on the satellite image below. Continuing Southwards the line meets the Avenue de Tuttlingen (D557) at a hairpin bend. 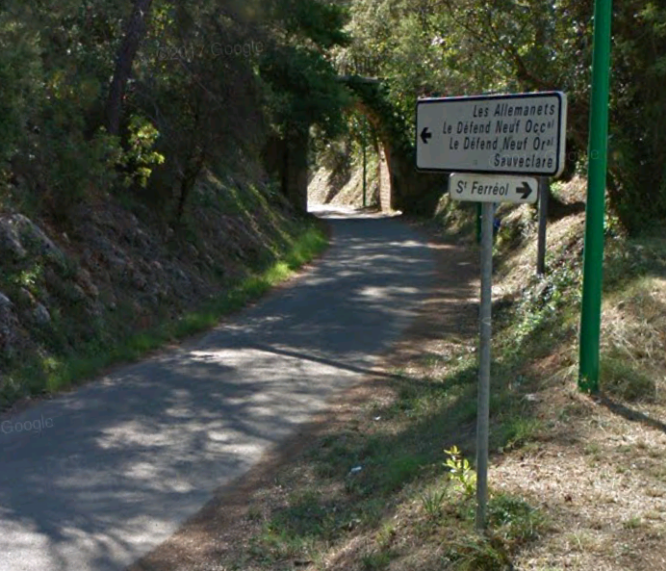 The picture above looks back down the line towards Pont d’Aups. 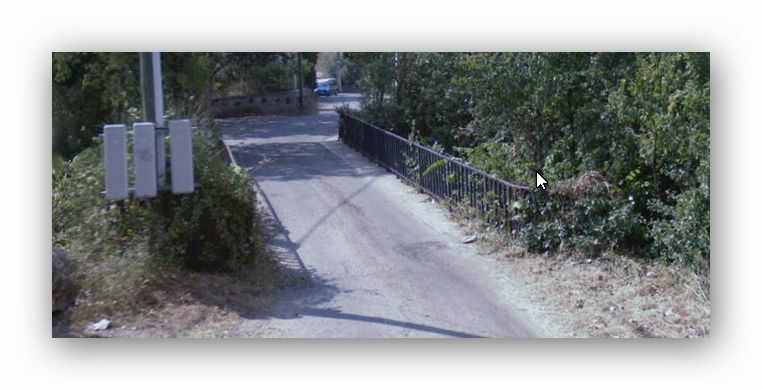 The cottage on the left is probably the crossing keeper’s cottage. 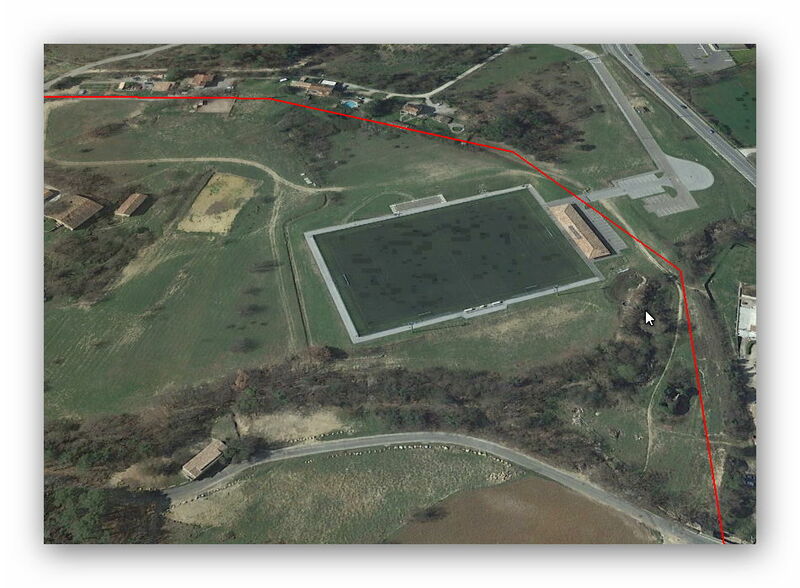 The route of the line follows the Avenue de Tuttling for the next few hundred metres as is illustrated below (the narrow black line on the image highlights the route of the line). 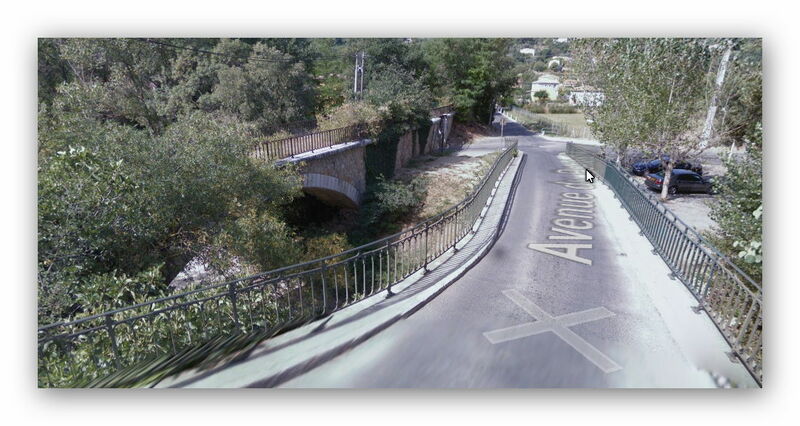 Its route can be picked out once again beyond the next roundabout and following the Avenue Salvador Allende (D557) in a North-westerly and then Westerly direction towards Flayosc. 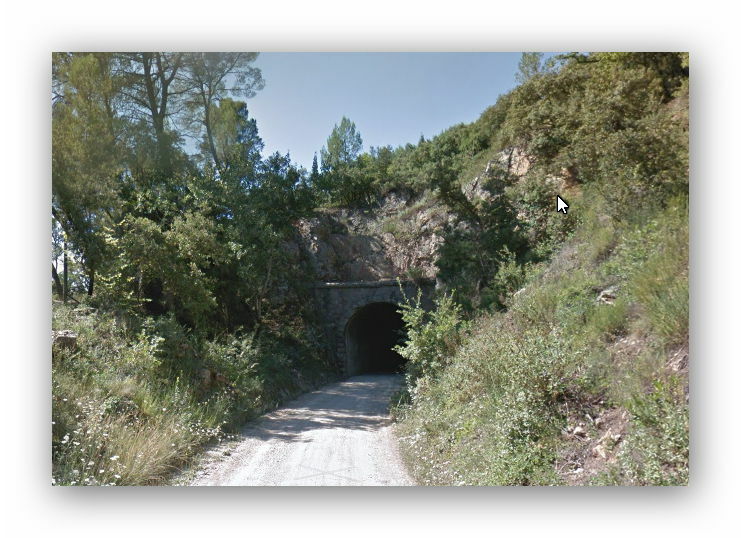 It would appear that along some of this length the railway was on embankment. 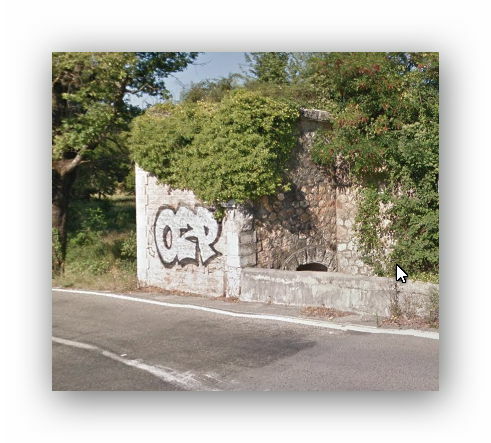 When we reach the road junction between the D557 and the D57 there are the vestiges of a road under-bridge evident on the route of the railway. 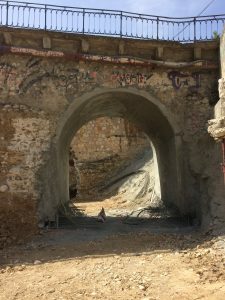 Generally, the embankment has been leveled to tie in with the immediate topography. 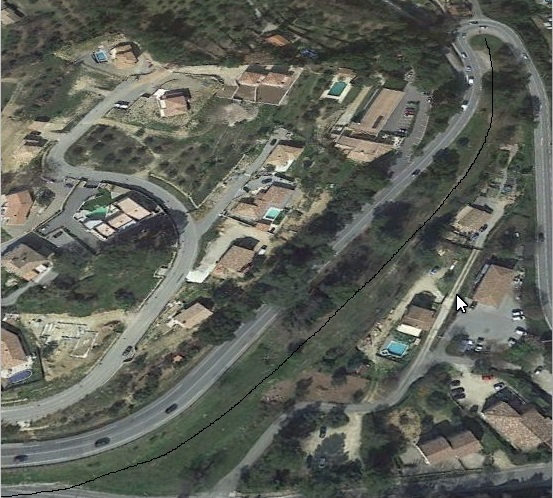 The vestiges of earthworks can be picked out on satellite views as the route of the line and the D557 separate. 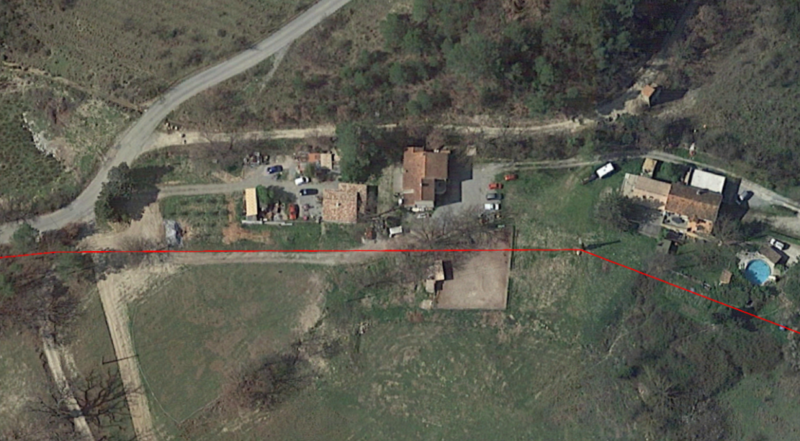 The route is highlighted by the red line on the satellite image. 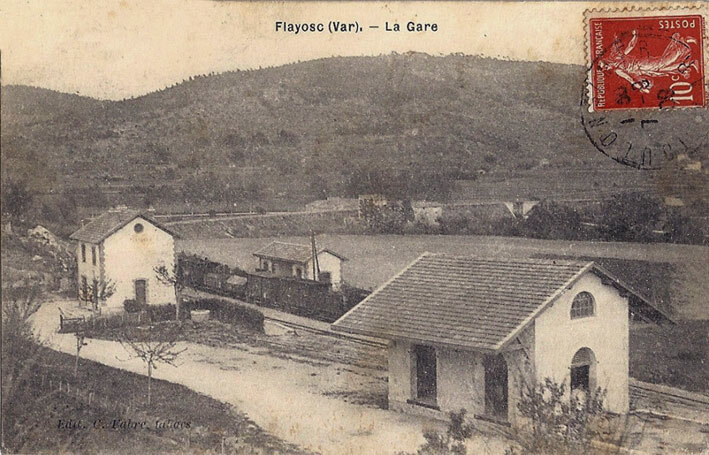 Towards the top of the picture is the location of Flayosc Station. 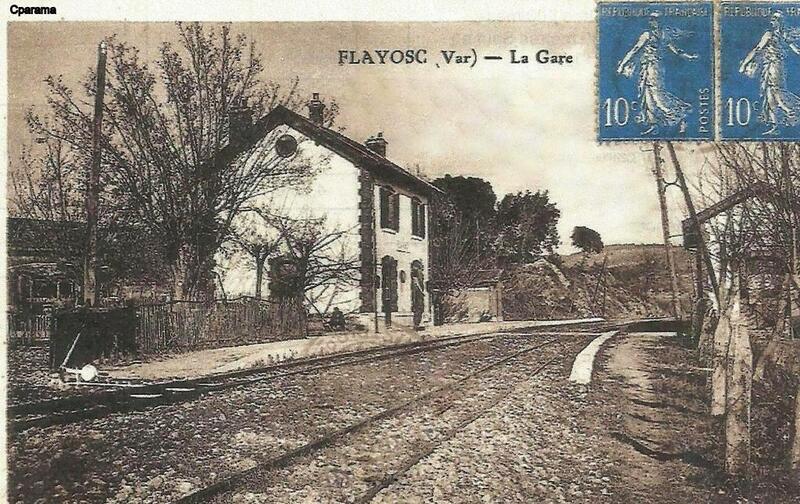 After Flayosc Station, the line headed off into the forest following the Vallon de Figueiret. 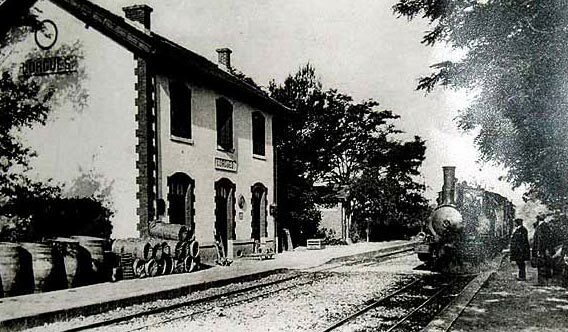 The railway formation has once again been converted into a narrow country road of which the picture below is typical. 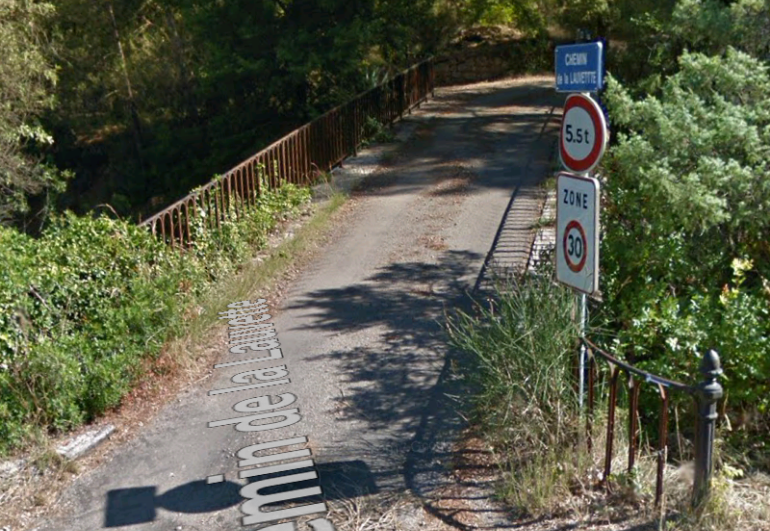 The road name is unsurprising … Chemin de l’Ancienne Voie Ferrée. 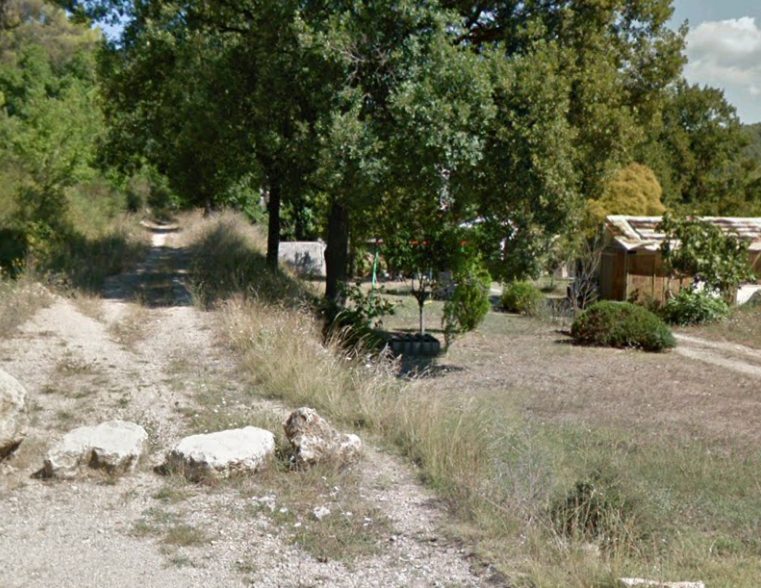 The road surface is gravel and is probably little changed since the railway was lifted in the 1950s/1960s. 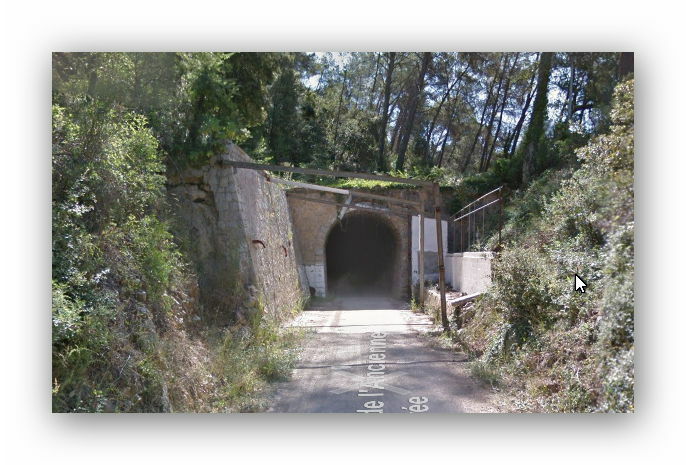 As the line travels south around Flayosc towards Lorgues, it encounters a number of relatively short tunnels. The first is shown below. 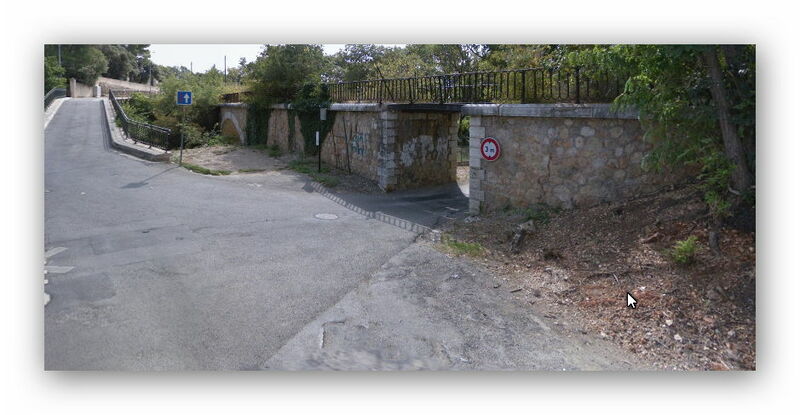 The first picture is its Northern portal facing along the line to Draguignan, the second is its Western, Lorgues portal. 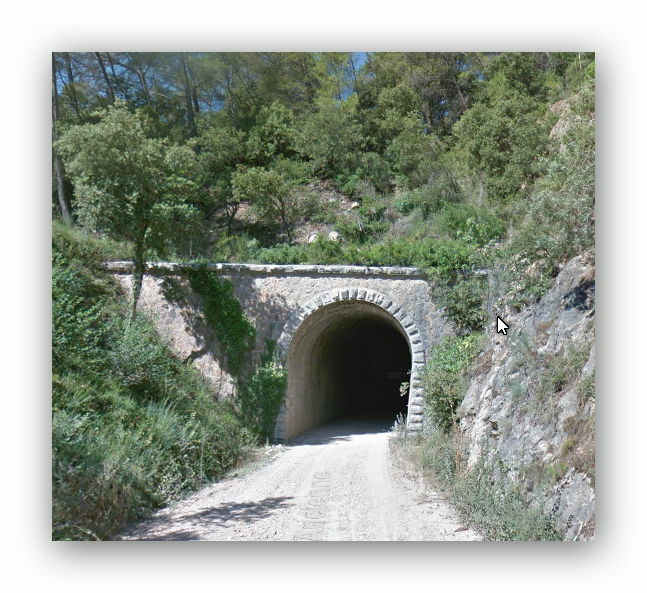 The tunnel is curved along its length. A short meandering length of formation leads to a second tunnel. 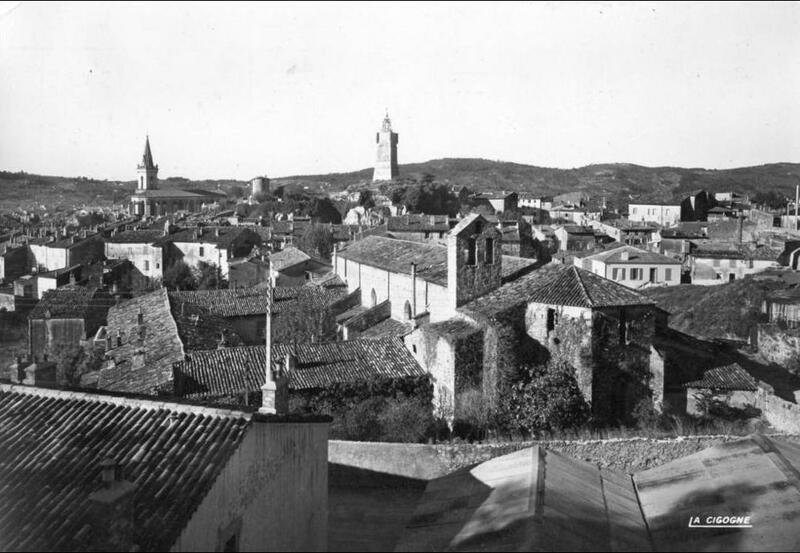 Its eastern (Draguignan facing) portal (on the left) gives way to a relatively straight tunnel travelling East-West. 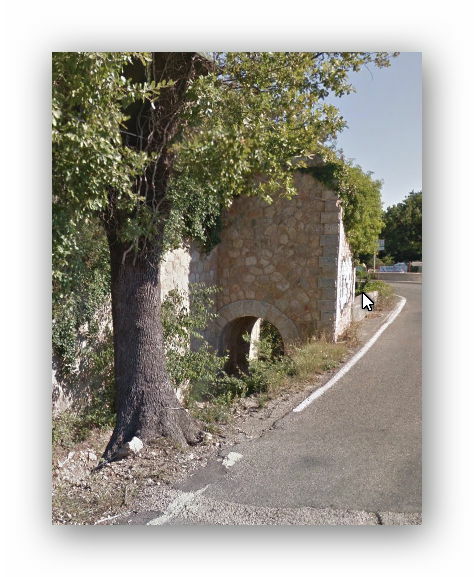 The picture below is the West portal. 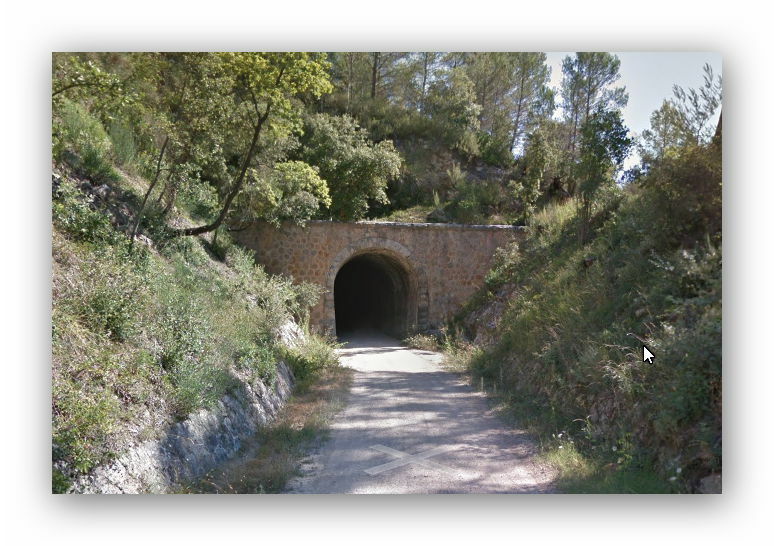 And a further short stretch of the line leads to a third short tunnel. 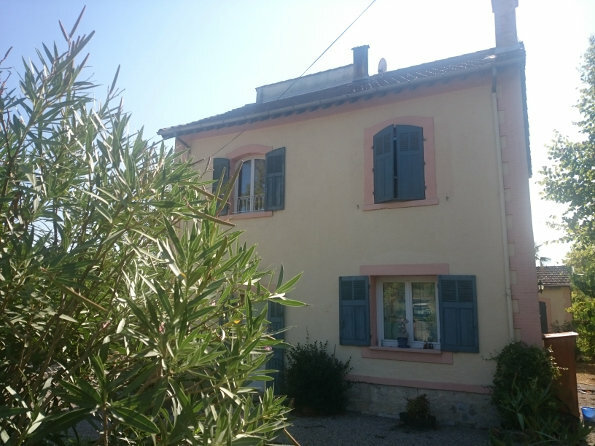 It then winds its way on through the forest towards the small village or Sauve Clare and the next encounter with a tarmac road. 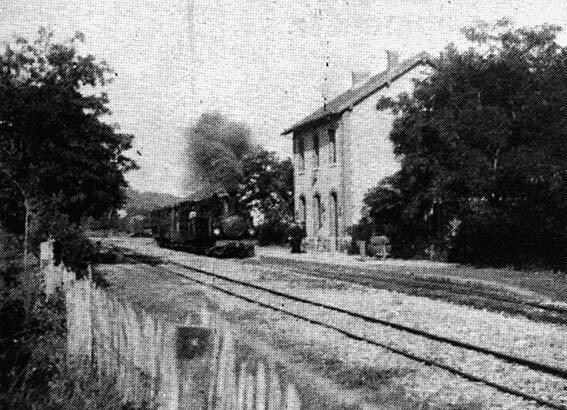 At Sauve Clare the railway passed under the village road. 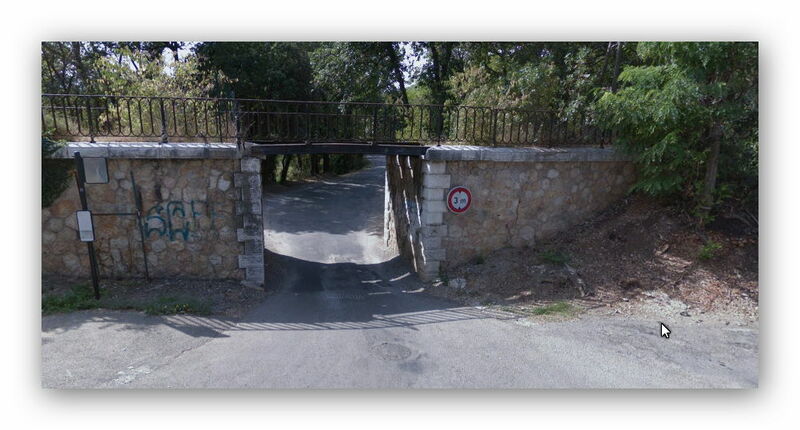 There was a short length of cutting and retaining walls either side of the line before a delightful bridge carried the road. 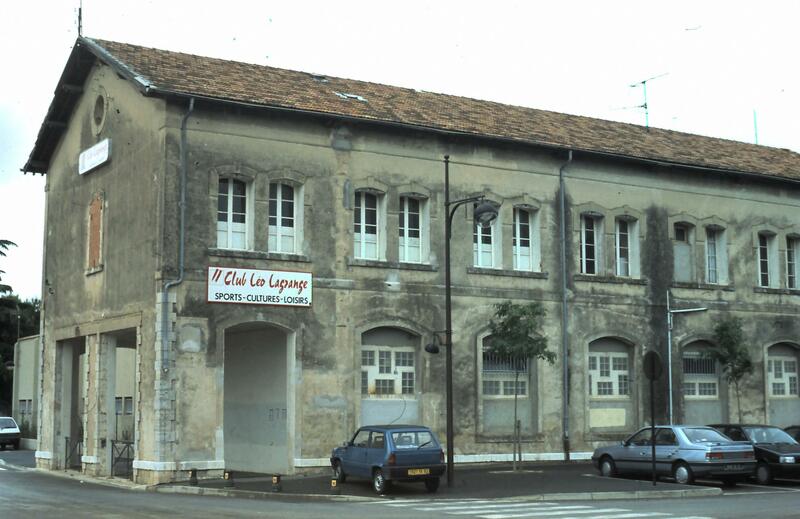 The adjacent church, Chapelle Saint Augustin, is worth a photo because it shows the proximity of the church to the railway bridge. 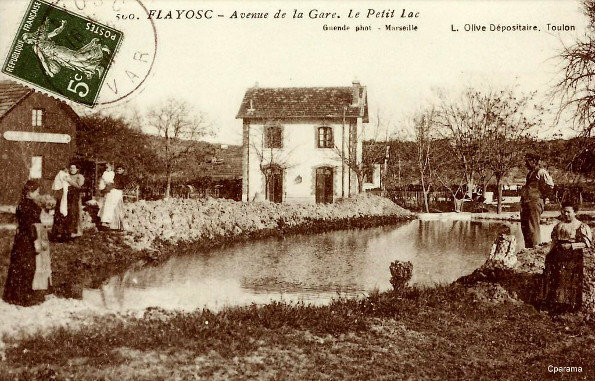 After the village of Sauve Clare, the line wandered away again into the forest heading for Lorgues. 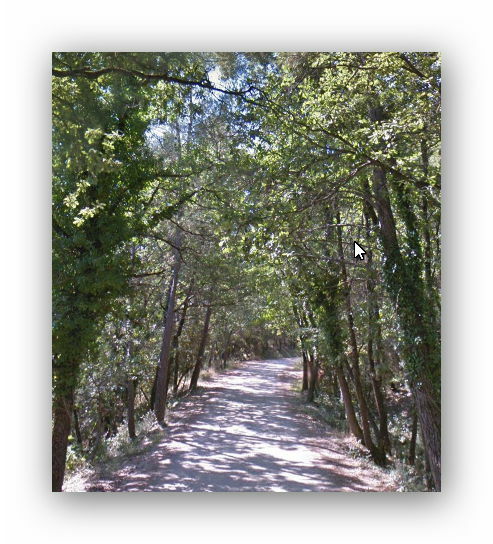 Eventually the forest road (Chemin du Train des Pignes East) that the route follows is once again properly tarred as it enters the suburbs of Lorgues close to the Hermitage de Saint Ferreol. 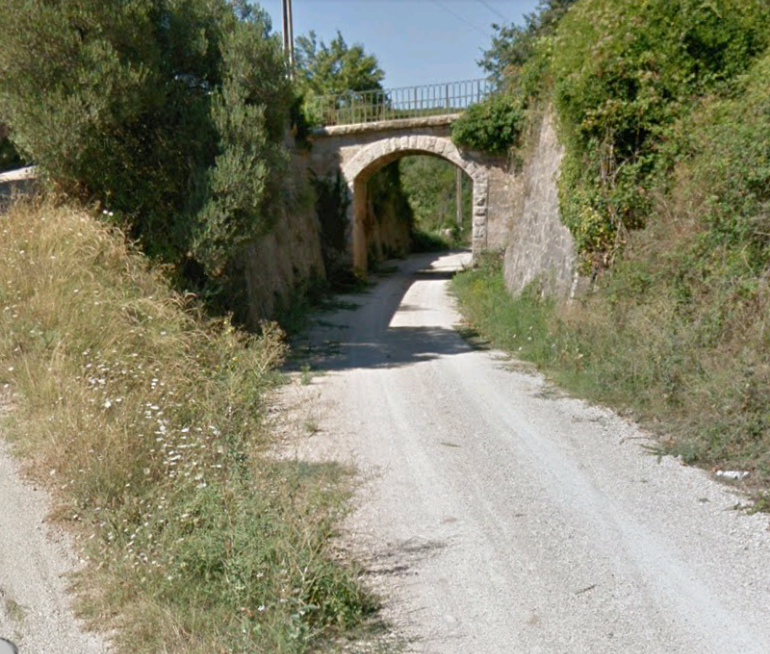 Another road bridge is encountered with the line once again in cutting before the landscape opens out into what is now private housing but which would probably have been farmland when the line was operational in the early 20th century. 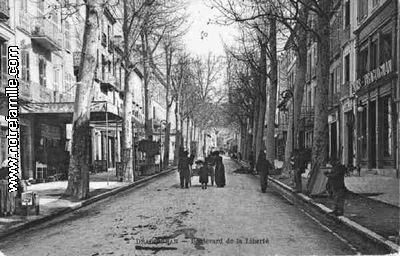 The line approaches Lorgues from the North-East and runs across the North of the town. 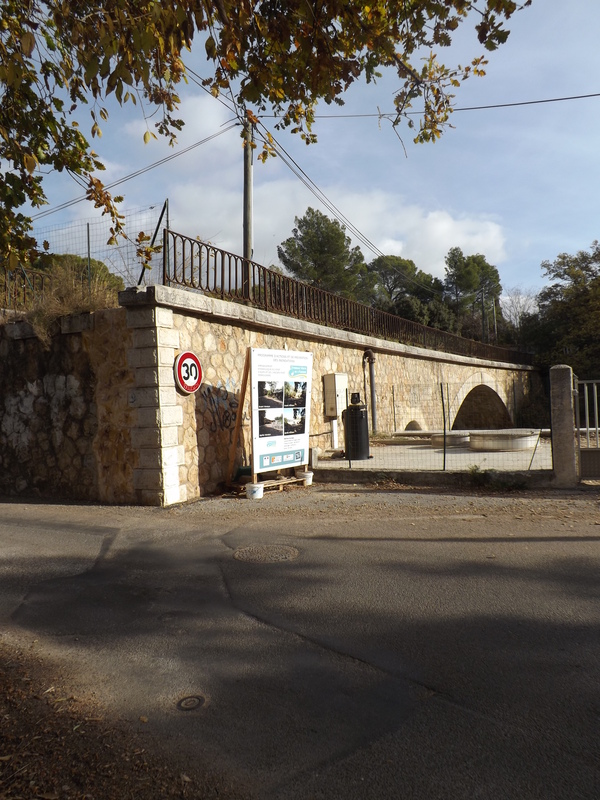 Another small bridge is encountered where the railway passes under Chemin de Berne before the line runs in a straight line into what was Lorgues Station. 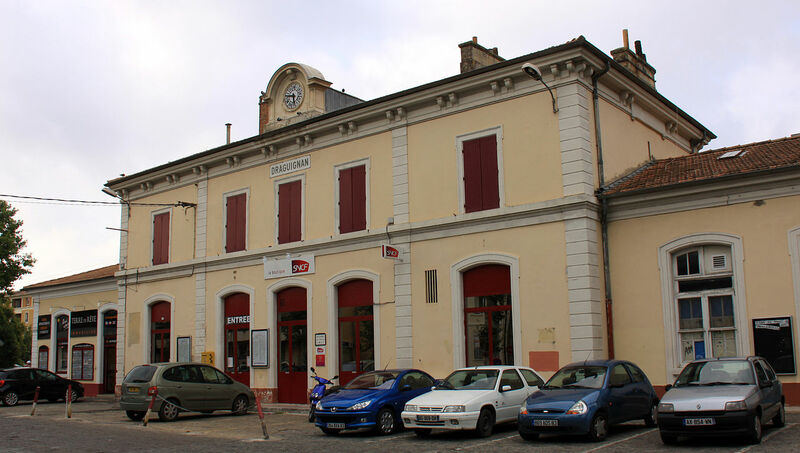 The passenger service from Lorgues to its station to the North of the town was provided by Louis Aune with a bus of 4 to 6 seats, the cost of transport was 5 cents. Aune was famous for having a small monkey always at his side in his seat. 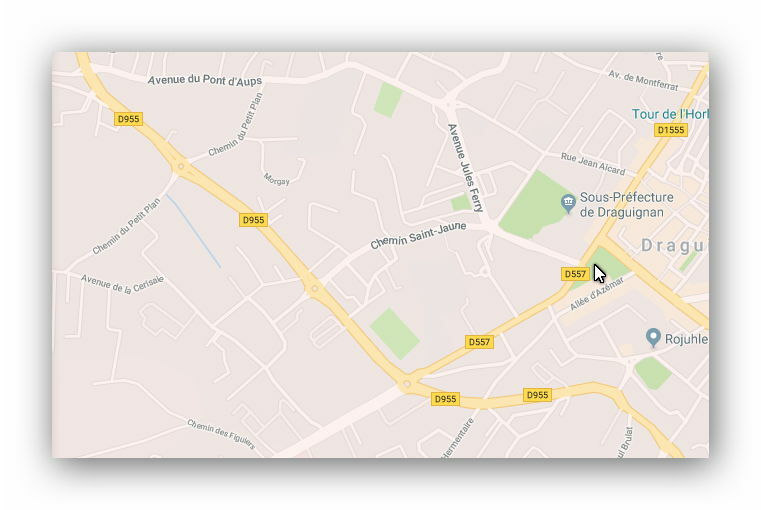 The pick up points for the ‘bus’ in the town were located at Rue de l’Église, at the Hotel de la Poste, and at Hotel Guirandi. 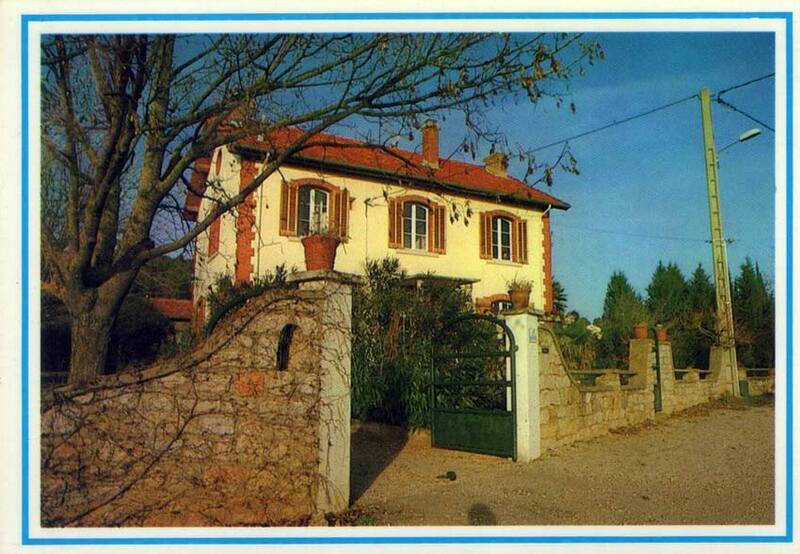 As time went by, Aune was replaced by Léon Icard and later by Phocion Collet. 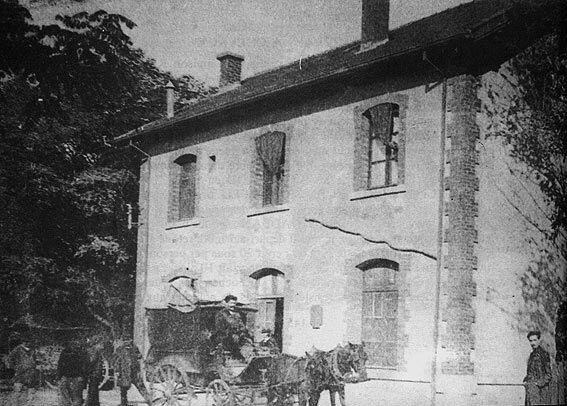 The freight service from Lorgues to the station was provided by Louis Allary with a truck 4 wheels . 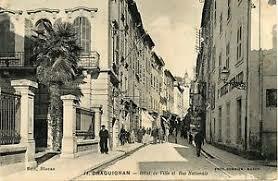 He has compettion from Monsieur Rousse who provided a service between Le Thoronet and Lorgues station. 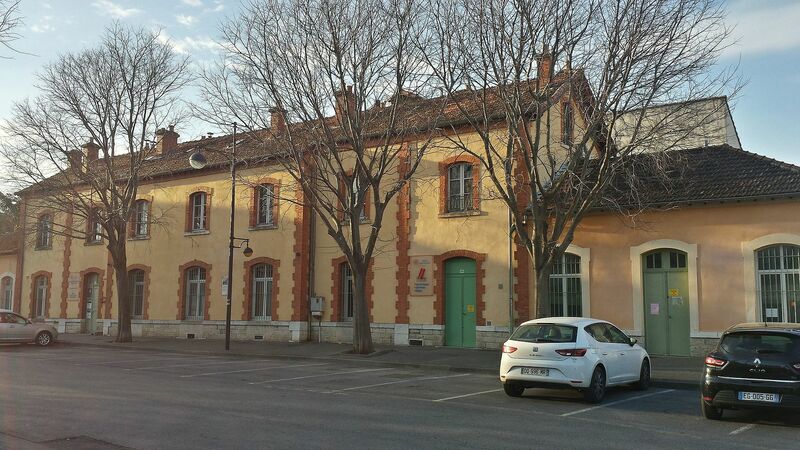 Its home base was Le Thoronet but he tried to compete on the route from Lorgues, with a base on Rue du Docteur Cordovan in the Old Town. A few photos before we take a break in Lorgues. Jose Banaudo, Le Train des Pignes; l’Editions du Cabri, 1999. 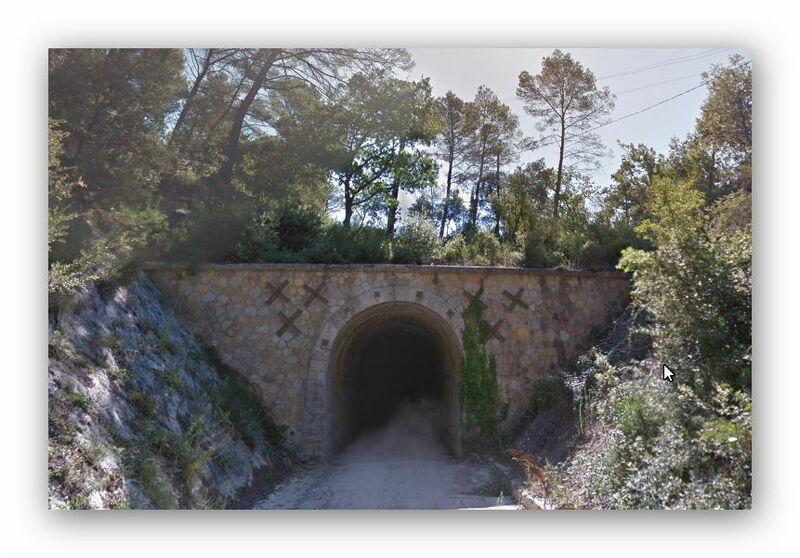 This entry was posted in Railways and Tramways Around Nice, Railways Blog on December 8, 2017 by rogerfarnworth.